So I'm driving along the other day, and I get up behind a Chrysler 200 that's moving at approximately the same speed as tree growth. As a car enthusiast, I know exactly what this means: Avis ran out of Chevy Malibus, and this guy is the victim. But my passenger was unaware of the 200's perennial rental car status, and she started to get mad at the driver's slow pace. "Why isn't this guy GOING ANYWHERE?" she said. "Come ON!!! Why doesn't he MOVE?!?!" At this point, I decided to calm her down. "This is a rental car," I said. "A tourist who came to our fair city to see the sights, and visit the attractions, and walk around with a fanny pack full of sunscreen." Her response: "How do you know?" And then it occurred to me: not everyone knows how to spot a rental car. Oh, sure, it's second-nature to us big city car enthusiasts, who are constantly checking out Lincoln MKZs, hopeful to discover that someone finally bought one, dismayed when we realize the lone occupant is an overworked 27-year-old consultant who can't remember whether he's in Columbus or Chicago. But there are people out there who don't know the tell-tale signs that the car in front of you is a rental, driven by an airport traveler who accidentally activates the windshield wipers when he's trying to turn on the headlights. So I've created a handy little guide to help you figure it out with only a few easy questions. I suggest you print this off and put it somewhere safe, so that you can easily locate it when you're cruising along and the comes time to play Tourist or Idiot. 1. Does it have little barcodes on the windows? Virtually all rental cars have little barcode stickers on the windshield, the rear window, and at least one side window. There's a reason for this: rental car companies want thieves to know exactly which cars are rentals, so the thieves can break in while you're sleeping and steal your camera equipment. Hah! Just kidding. The bar codes are placed in the windows so the rental car companies can scan the car when it goes in and out of the lot, in order to keep track of it. The result is that most rental cars look like they have Target-style pricetags all over the exterior, which is actually rather fitting. "One Nissan Altima with hubcaps, sir?" the check-out person would say, at the enormous, imaginary, automotive version of Target. Then they'd scan the little window barcode ("BOOP!") and you'd go outside and realize you meant to get a Camry, but what the hell does it matter, they're all the same anyway. Then you'd forget about it and go buy lightbulbs. 2. Does it have any dealership markings? Here's another crucial rental car issue that can occasionally trip you up. Say you're stuck behind a new Malibu, and the driver is going incredibly slowly, and the car is painted in some horrendous fleet-only color, such as Orlando Airport Teal Metallic. This probably leads you to one simple conclusion: rental car. But wait! You suddenly notice the car actually has a dealer license plate frame and a little dealer badge on the trunk that says something like Jimmy Smith Chevrolet: Don't Even Try to Beat a Jimmy Smith Deal, Or We'll Cut Off Your Thumbs! It's at this point you remember something crucial: some people still buy the Chevy Malibu, because of its comfort, and its equipment, and its driving experience, and because they receive gigantic, five-figure supplier discounts. Indeed, a rental car will almost never have any dealer markings. This is because rental car companies deal directly with automakers, usually on the last day of the month when the automaker is trying to hit a sales target. "Hello, Enterprise?" the Hyundai fleet guy will say. "We're doing a buy-one-get-one-free on Accents today only. OK, fine, buy one get ten free. OK, fine, you don't even need to buy any. Please just take them. They're 2012 models." 3. Does it have rental car plates? When I was growing up, most U.S. states did away with "rental car" license plates because they thought it was a really good way for people to get murdered. From what I gather, here's what happened: a set of tourists would be driving along in someplace like Florida, where everyone has guns, including the alligators. And these tourists would stop to photograph the sights, and observe the natural beauty, and of course take a series of overexposed photographs while posing next to local wildlife, which includes insects the size of a briefcase. After a while, a roving gang of street thugs would see the "rental car" plates and pull over, eager for some tourist blood. "Are you from around here?" they'd say. If you said "Yes," they'd spare you and move on to the next set of confused tourists with rental car plates. But if you told them you were from somewhere exotic, such as Germany, they'd murder you and steal all your sunscreen, and possibly even your fanny packs, assuming by this point they weren't covered in blood. So rental car plates died out for a while, but they've recently come back. This is especially evident in Colorado, where the rental cars all have bright red license plates that say "FLEET" on the side, as if to tell everyone: I am an idiot tourist. Please murder me and steal my fanny pack. Also: which way to the mountains? But even if your home state doesn't issue rental car plates, a shiny, new license plate on a car that's covered in barcodes and unadorned by dealer badges typically means just one thing: the driver is currently trying to figure out how to turn on the headlights. 4. Is it a Chrysler 200? Say you're cruising along, and you're not close enough to see if a car has any barcodes, or dealership markings, or rental car plates. Is there some OTHER way you can identify whether it's a rental car? The answer is: yes, there is. 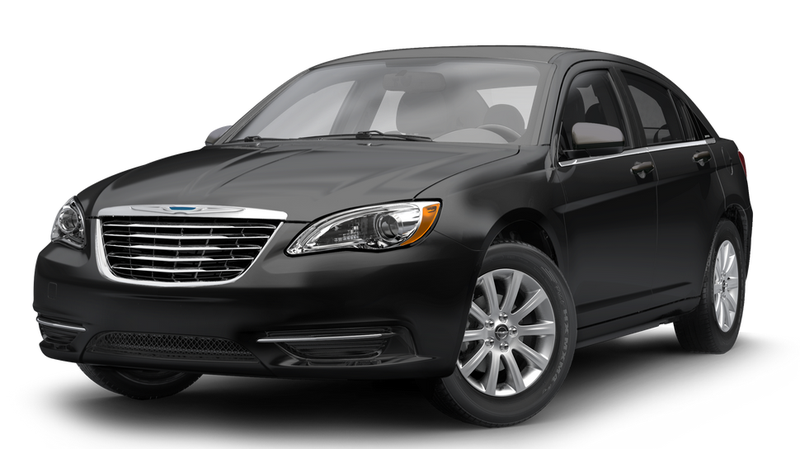 Simply ask yourself: Is this car a Chrysler 200? If the answer is no, then it requires further investigation. If the answer is yes, then DING DING DING!!! You're following a rental car. Now, I know what you're thinking, and that is: Not EVERY Chrysler 200 is a rental car! Some of them are driven by new hires at Chrysler, before they know what's best for them! And in general, I agree with you. But here's my thinking: the kind of person who actually purchases a Chrysler 200 using their own money is probably so misguided and confused that they should be given the same wide berth as a rental car, because you never know what they might do next. They might rapidly change lanes. They might inexplicably back up. They might pull over and attempt to include you in a multi-level marketing scheme. So there you have it, folks: a quick, handy guide to spotting a rental car. Now let's use it to be a little nicer to our tourist comrades. Less honking. Less tailgating. Less murdering.